Leasing is now more popular than ever. In fact, Millennial car buyers are leasing 46% more over the past five years because they are able to afford their dream car at a much lower cost. If you've thought about leasing a vehicle, then we've provided what you need to know before visiting the dealer. The benefit of leasing a vehicle is that it is a shorter-term option, as opposed to buying a car. A simple way to think of leasing is as a long-term rental option. You will pay for the car while you need it, and at the end of your lease, you'll simply return it. Lower repair costs, because the warranty will cover most of them. Lower sales tax, since you'll only be responsible for paying sales tax on the portion of the car you finance. Lower monthly payments compared to buying. Typically, there is no down payment, or a very low down payment, required. Fewer obligations — at the end of your contract, you simply turn in the keys and walk away. New vehicles every few years. Once your lease term is up, you can choose a new lease and enjoy all the benefits and features of a new car. This also means that you can drive a better car for less money every month. On the other hand, you won't be able to customize your vehicle. Lease terms usually last between two to four years. However, every leasing contract is different, so you want to find out specifics, like the length of the term and the mileage cap (which is typically between 12,000–15,000 miles/year). Most drivers agree that leasing contracts can be very confusing, even more so than when buying a vehicle. If you'd like to go in as prepared as possible, consider reviewing some common contract terms. There's a long list of costs, terms, and fees on a lease contract, but the key items to look for are pretty clear. This is the sticker price of the car. Like everything else in life, it's negotiable. Don't pay full price! This is the price of the car less negotiation, rebates, trade-in, and down payment. When you turn in the car at the end of the lease, the carmaker estimates it will still be worth something; the car's residual value. The higher this number, the lower the depreciation (and the lower your payments). This is the value of the car over the months and miles you will be driving it. You can think of this as the rental fee for the car. Or you can think of it as Adjusted Capitalized Cost - Residual Value. This is the interest rate you'll pay, but it's not a straight forward interest rate.To compare it with an actual interest rate, multiply it by 2400, so you have a better idea of the value of the loan. This is also negotiable. This interest rate will be charged to the sum of Adjusted Capitalized Cost and Residual Value. It seems like double counting, but you're paying for both the use of the car and money the finance company "loaned" you to lease the car. It may appear on your bill as Finance Charge or Rent Charge. Finally, this is what you'll pay each month. It's simply the Depreciation + Finance Charges + Sales Tax. A good lease deal is one with the lowest Adjusted Capitalized Cost, the highest possible Residual Value, and the lowest possible Finance or Money Factor. Be sure to negotiate for all three! As is the case when purchasing a car, you will have a number of financing options available to you when leasing. Make sure to research lease specials and financing options in your area before visiting a dealership. Use Edmunds' Price Promise tool to find special offers near you. Leasing can be difficult if you don't have good credit. If you aren't getting the financing terms you're after, then the DMV recommends first working on raising your credit score, offering a higher down payment, or lowering the annual mileage of your lease. If you have a vehicle trade-in, this can be a great start for your down payment. Remember, the higher your down payment is, the lower your monthly payments will be. On the other hand, some experts recommend putting as little down as possible because if your vehicle is wrecked shortly after leasing, you will be out of any money you invested upfront. 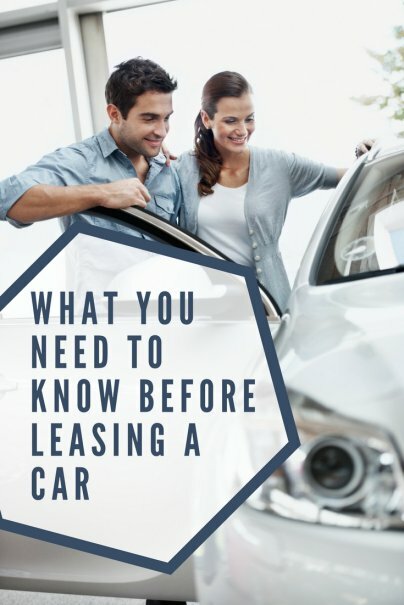 A leased vehicle is basically a rental, so it's even more crucial that you follow maintenance requirements on time because you could be charged extra fees if you don't. You will also need to be more careful when driving the vehicle around, because you'll be responsible for paying wear-and-tear charges for any damage — even small cosmetic issues. Leasing agreements can have additional fees involved, such as lease drive-off fees and fees when turning in the car. A drive-off fee is a deposit that needs to be made upfront and includes your first month's payment, and usually adds up to about $1,000 extra. If you go over your mileage cap and have driven more than your leasing agreement specified, then you may be subject to another fee. Consumer Reports estimates an excess mileage penalty of $.10–$.25 for every additional mile. Review your lease agreement and ask the dealership about any additional fees you should know about. Another downside to leasing a vehicle is that you will never truly own it. You will only pay for the use of the car (as long as you drive it). However, at the end of your leasing agreement, you may have the option to purchase the vehicle for a discounted price. Once a car buyer pays off the car they've purchased, they can drive it around for years without making a payment. But a person that leases will have to keep paying for their vehicle month after month. This can mean big savings for a car buyer after they've finished paying off the auto loan. So, what happens if you decide to turn the car in early? An innocent mistake like this can result in thousands of dollars in termination fees. Often, with early termination, you will still need to return the car and pay what you still owe, which results in a lot of wasted money. Your leasing contract should specify the early termination penalties and conditions, so you'll know what types of fees to expect. There are other options for breaking the lease early, but they can be difficult undertakings. For instance, you can find someone to take over your lease and assume the payments, but this can be a time-consuming and stressful process. You can also work with a company or lease-trading site that can help you sell your lease to interested buyers (for a fee). Your dealership may also be willing to trade in your vehicle for another vehicle. Lastly, you might be able to buy the vehicle from the dealership or sell the vehicle to a private party. Is GAP insurance included? GAP insurance will protect you in the event that the car is stolen or totaled in an accident. What do the warranties cover? You'll want to find out about extended warranty information and what's included in your coverage. Then, you'll know which maintenance services and repairs you'll be personally responsible for. Can I transfer the lease later? In the event that you need to terminate your lease contract early, you'll need to make sure that your leasing contract will permit this. Asking upfront if the dealership allows lease transfers will save you a lot of time and frustration later. What will the total cost be? You might get sidetracked by the lower monthly payments, but in the end, leasing may be more expensive than you think. Inquire about the total cost so that you can get a better picture of what you will be paying in the end (not just per month). Do you have other tips for leasing a car? Please share your thoughts in the comments!